How long and how often do you brush your teeth? Do you give them the once over and run out the door without using floss or mouthwash, or do you take time to make sure every tooth knows it’s cared for by doing the full dental hygiene routine? More often than not we fit the former category, mainly because we’re running late most of the time, but also because we’re not really thinking about it too much. It would definitely help if we set a timer on our phones to make us consciously aware of how much time we’re spending on our pearly whites. Of course, you may not always have your phone with you, or remember to open up the clock app and set a timer. 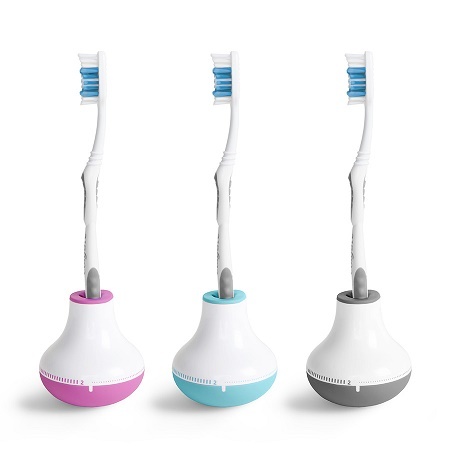 The Bobble Toothbrush Holder and Timer is a way to solve that issue, as it will not only keep your toothbrush off of germ-infested surfaces when you’re not using it, but it will also set up to 2 minutes of a timer so you know how long to keep brushing. It is weighted and has a rubberized base so that even wet surfaces won’t have it sliding off the side of the sink. This ticks the time away so there’s a constant audial reminder happening, and it comes in white with an accent color of pink, grey, or blue. It is a very simple gizmo that you should be able to manage without, but it only costs $5.10, and if nothing else can replace your current toothbrush holder.